Low Carb Diet News - Tag Archive for "Dietary fiber"
Now, today, I read this story in the UK national daily The Express [more examples linked to below] which tells us how stupid we all are for thinking fibre can be found in foods like chocolate, eggs and beer, and bemoaning the fact that some us can go short on fibre if we eschew bread. Sound vaguely familiar? Well, you won’t be too surprised to learn that these nutritional nuggets have come from a survey conducted by, wait for it….Warburtons. On this occasion, it appears that the BNF [British Nutrition Foundation] has not been co-opted to help Warburtons sell its message, though GP (family physician) and TV doctor Dr Hilary Jones makes all the right noises with a general condemnation of low-carbohydrate diets. The original industry paid-for pro-bread review seemed to me to provide a wholly biased account of the role of bread in the diet – a piece of balanced ‘science’ it most certainly was not (in my opinion). 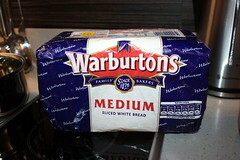 So, what about this latest salvo from Warburtons? Is fibre all that important, as is claimed? The sort of fibre found plentifully in, say, wholemeal bread is known as ‘insoluble’ fibre – more colloquially referred to as ‘bran’ or ‘roughage’. This is said to provide bulk to our stools, and help prevent constipation and colon cancer. Actually, insoluble fibre can irritate the gut, and provoke symptoms such as bloating and discomfort. On the other hand, the other main form of fibre – ‘soluble’ fibre – tends to improve bowel symptoms such as constipation and abdominal discomfort . Soluble fibre is found abundantly in natural, non-processed foods such as fruits, vegetables, nuts and seeds. The idea that insoluble fibre helps prevent colon cancer is often expressed, but is not supported by the research, either. For example, studies show supplementing the diet with fibre does not reduce the risk of cancerous tumours or pre-cancerous lesions [2-4]. The authors of a review on the role of fibre in lower bowel conditions including cancer concluded that “…there does not seem to be much use for fiber in colorectal diseases”, adding that their desire was to “emphasize that what we have all been made to believe about fiber needs a second look. We often choose to believe a lie, as a lie repeated often enough by enough people becomes accepted as the truth” .